Looking for Greek yogurt? 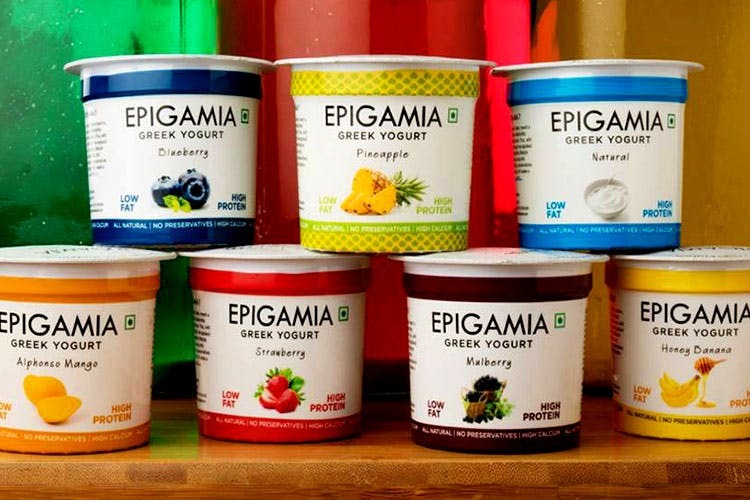 Epigamia’s got them in many fruity flavours, which makes it perfect for snacking in between meals. The Greek yogurt tastes fresh, is mixed with real fruit, and has a pulpy texture. Plus it’s a great alternative to white flour sandwiches and chips, cream biscuits, and other unhealthy snacks. It’s full of protein and calcium and great to satisfy food impulses. I’ve tried the blueberry flavour, which has a smooth texture and is sweet and a little bit tangy. Apart from that they’ve got flavours like mango, strawberry, mulberry, honey-banana, and more. Get yourself a bunch of these and stock them in your fridge. Where: You can find it in supermarkets like Modern Bazaar, Big Basket, and Nature’s Bazaar. Greek yogurt has more protein than regular yogurt, and can make for a huge lifestyle shift. It will leave you with more lasting energy as compared to junk food.